Growing out your hair can be a long process, requiring lots of patience — and careful attention to your locks. To help your strands make it through the months and months of grow out and to keep them as healthy as possible, we asked a few top hairstylists for their best tips on how to protect the ends of your hair. Here are eight suggestions that will keep your mane looking fabulous as you wait out the growth process. Don’t Neglect Your Scalp: Stylist Frank Barbosa, who’s currently working with Chloë Grace Moretz on the set of the upcoming thriller “The Equalizer,” says that the key to keeping your ends healthy is actually maintaining a healthy scalp — if you focus solely on treating your ends, you’ll experience more hair fall, making your long locks thinner. Be sure to use a scalp treatment, which will keep your follicles moisturized. Another way to keep your scalp healthy is to brush your strands daily, says stylist Rodney Cutler. Brushing your scalp is key to stimulating hair growth and brushing through the length will help to distribute natural oils that can build up on the scalp. Use a natural boar bristle brush, such as a Mason Pearson, he suggests. Be Gentle with the Ends: Ouidad’s Creative Director, hairstylist Morgan Willhite, says you should care for the ends of your hair like you would care for a cashmere sweater. Cleanse and condition hair very gently, avoiding harsh shampoos that contain high foaming detergents (they strip out natural hydrating oils). Scrub your scalp, not your ends and avoid elastic hair ties — they cause friction that encourages breakage. Wash Your Hair Less Frequently: Cutler says you should only wash your hair a maximum of three times a week. This will prevent the ends of your hair from drying out too much, as shampoo can remove your hair’s natural oils, which can lead to damage and breakage. If you workout or just miss the feeling of washing it, you can still give your hair a good rinse with water and add conditioner to the ends in between shampooing, he advises. Take Your Vitamins: Barbosa notes the importance of getting protein and nutrients into your body for healthy grow-out, explaining that when he works on a film, he suggests the cast start taking fish oil liquids and vitamin B12. Cutler adds that vitamin E is proven to help maintain and improve hair and skin health, for that matter. You can purchase the gel capsules and take one as a supplement and split another in half, applying the oil directly to the ends of your hair to strengthen and help with split ends. Avoid Heat Styling as Much as Possible: Heat causes hair to dry out or even can burn the hair follicle, causing a great amount of damage if you aren’t careful, Cutler warns. To keep hair happy and healthy, allow it to grow and let it air dry as much as possible. If you need to use a hair dryer, curling or straightening iron, be sure to use a product with heat protection, such as Redken’s Real Control Thermal Resist or Supple Touch, to minimize the damage while strengthening the hair. But while you want to avoid too much heat-styling, a little heat can be a good way to repair your hair internally, Willhite says. Whether you’re doing a deep treatment, conditioning mask, or hot oil, using a blow dryer, steam, sauna, hot towel, or even sitting in the sun will open the hair’s cuticle allowing the conditioning proteins to strengthen the hair from the inside out. Blow Dry the Right Way: Of course, never heat-styling your hair while you grow it out is unrealistic. 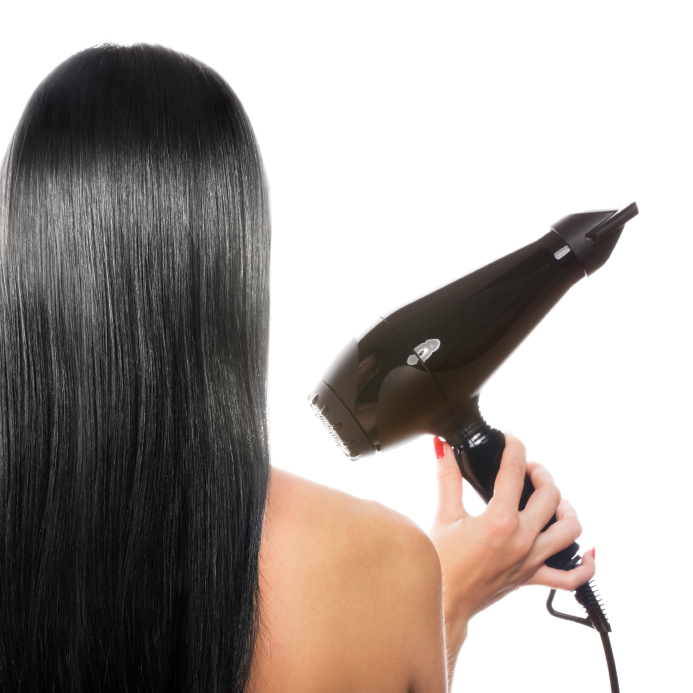 So, take this tip from stylist Nunzio Saviano on how to blow dry properly: Start blow drying at the root through mid length and do not hold dryer over your ends for too long because they can break. (You can even cause brittle ends from just one blow out, he cautions.) And remember: Always use a heat protectant spray before styling your hair with a blow dryer. Barbosa also suggests using a product to seal the ends once the hair is dry for extra protection. Opt for creams instead of oils to apply on dry ends, he says — you’ll not only get a better finish, but a healthier look as well. His recommendation is René Furterer Karite Intense Nourishing Leave-In Repairing Serum, which has a creamy consistency to help to nourish and shine. Try a DIY Remedy: You can create effective hair masks with natural ingredients such as avocado, honey and olive oil, Cutler says, even combining the three to create a super rich conditioning treatment. Mash up enough avocado to cover the length and ends of hair, then add a tablespoon each of honey and olive oil. Apply to hair, wrap in plastic wrap or toss on a shower cap and let sit for 30 minutes. Rinse thoroughly and let air dry. Dust Your Ends: Willhite says that when people are in the process of growing out their hair, they often avoid trims in hopes of achieving their goal length faster. But by doing this, your ends can become very dry, causing the individual strands to split — and leaving you with shorter hair from breakage. Cutler adds that a split end can end up splitting all the way up the length of the hair, leaving it weak. As much as it might seem counterintuitive, cutting will help keep your hair looking even and clean at the ends, as opposed to ragged and thin. So, instead of letting your hair just grow, Willhite suggests getting a “dust” or “micro-trim” on your ends every eight weeks. Ask for a trim that’s so small you can’t see hair on the floor.